If you want a memorial that will last, then the best headstone material is either granite or bronze. Both are known for their durability. However, a lesser-known alternative is the field boulder. While it will not last quite as long as the other two, it will hold up to the elements. Let’s take a look at these Top 3 Choices for Headstone Material in greater detail. Some cemeteries require you to purchase a flat bronze marker. Bronze markers are made in a foundry using an alloy made up of 80% copper + 20% metal that lasts for a very long time. Today’s bronze memorials need not be boring! Custom photos, artistic scenery and of course detailed statues are all possibilities with a bronze memorial. Primitive bronze artifacts have been found dating back to early Greek and Roman cultures thousands of years ago. It is thought that today’s bronze memorials, which are much better quality, will last virtually forever. Even though it lasts a long time, bronze can be a bit expensive. Pound for pound, when it comes to bronze vs. granite, there is no comparison. If you want a big memorial, you will pay hundreds of thousands of dollars for a bronze one. This is why most larger memorials today are not constructed from bronze. Granite is essentially the hardest stone other than a diamond and is over twice as hard as limestone. While technically some granites are harder than others, ANY granite will essentially last forever. Therefore, your granite memorial should look and weigh the same today as it would in 100,000 years or more. The cost of granite has come down quite a bit in the past 20 years. This is mostly due to foreign granite competition as well as automated equipment, which continues to revolutionize the industry. Granite comes in an infinite number of colors, all natural. 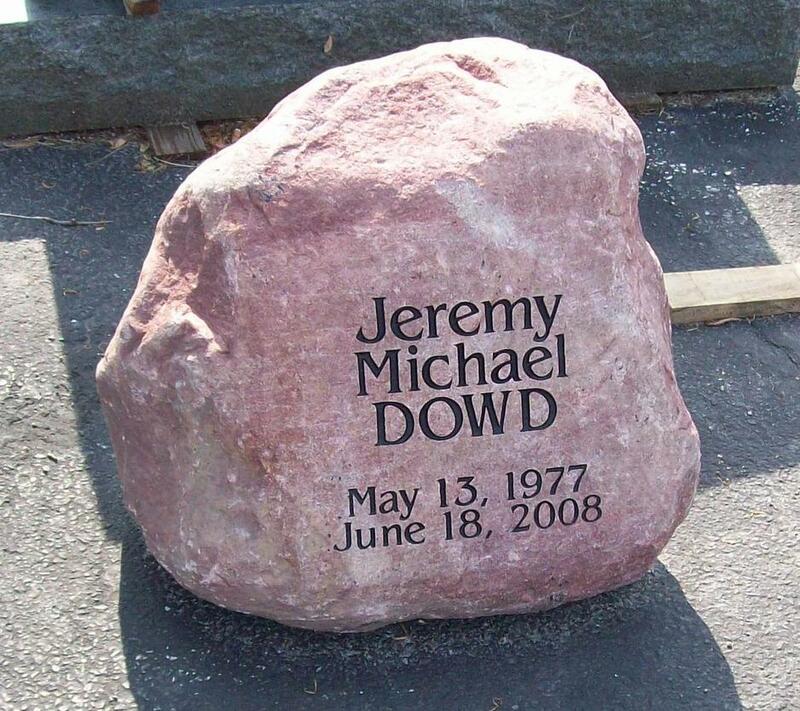 The stone can be shaped into just about any shape and a polished finish can make your memorial shine like glass. We can even etch pictures or photos into the granite. Some people like the look of a boulder as a monument. They are unique, but you will need to check with your local cemetery to see if they meet their regulations. A boulder should last quite a long time, but unlike granite, there is no rating system. When you get a boulder in a field, you have no idea how hard (or soft) it is. Some are very hard and some are very soft. Only time will tell. Boulders are the least expensive of the three headstone material. They’re plentiful and require no mining, cutting, and polishing. However, what you save in material cost you will pay back in the increased costs of engraving and installation. Since a boulder is not flat or polished, it takes much longer to engrave it correctly. Likewise, since the boulders are not flat on the bottom, they take much longer to correctly set in wet concrete at the cemetery. There are a number of unique ways to use a boulder as a memorial. You can engrave them, polish them, and even install color photos in them. Always in Stone designs custom memorials for the people of Elkhart County in Indiana. If you want more information on how you can order headstone material, come to our showroom or give us a call. We can help you with the design and offer delivery and installation to any cemetery in our service area.